We’d love your help. 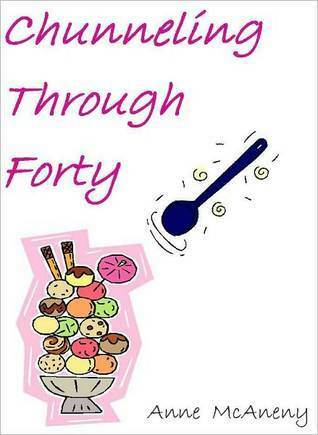 Let us know what’s wrong with this preview of Chunneling Through Forty by Anne McAneny. To ask other readers questions about Chunneling Through Forty, please sign up. This was a great read. I loved the light-hearted humor throughout the story, and wondered how the author had managed to get into my head and learn of all my disjointed thoughts! This book takes a very positive look at aging, as we follow the life of a woman who just turned 40, and jumps on the fast track of crossing off every item on her bucket list. It's wonderful to follow her through her mishaps and victories, and ultimately to a proper perspective; all while "hearing" everything going on insi This was a great read. I loved the light-hearted humor throughout the story, and wondered how the author had managed to get into my head and learn of all my disjointed thoughts! It's wonderful to follow her through her mishaps and victories, and ultimately to a proper perspective; all while "hearing" everything going on inside her head. "Little self esteem, NO self confidence.."
Oh I know, I'm a man, and being too old at 70 I couldn't possibly understand.. But are there really so many women out there that can't stand up for themselves in a conversation, that can't simply state their feelings without completely folding at the first hurdle? Why is that so many people take it upon themselves to worry about, therefore to take responsibility for other peoples' feelings and reactions? How is it that so many people don't realise that the "Little self esteem, NO self confidence.."
Why is that so many people take it upon themselves to worry about, therefore to take responsibility for other peoples' feelings and reactions? How is it that so many people don't realise that they do not control other peoples' minds, therefore to try to take responsibility for the way people take in information is almost the apex of presumption? So, some of the above diatribe is what I see in this novel; the main character appears to take it upon herself that nobody is hurt by anything she says or thinks, thereby constantly causing herself discomfort because she dare not open her mouth. On top of that she is so almighty conscious of herself, her figure, her age, her uncertain thoughts that I must say I am impressed that she actually decided to take aerobic classes, or even talk to almost anybody at all; indeed it seems quite uncharacteristic that she did. They say that a character has to be somewhat of a reflection of the author so I am impressed that this author wrote it all down..
Meh. I was looking for some lighthearted chick lit for a quick and easy read. Creeping up on 40 myself, I liked the concept, but the book got a little too serious (and a bit preachy) for me towards the end. Cut out the "maybe one of us is having an affair" parts, and just focusing on the madcap adventures surrounding the goals and I think it would have been better. Funny at times. I could relate to her in many ways! Loved Eddie! I could relate to many of the themes, though I didn't take turning 40 as such a terrible thing as did Susanna. I loved the character of Eddy. Not a rock your world. But a fun witty look into an ordinary life and growing older. Sweetly satisfying to the end. This book sounds far better than it is. It was free. Some books should not be published. Just couldnt get into it. There were funny moments but overall for me it was just okay. For many years, Anne sharpened her writing skills on screenplays that often became contest finalists. Today, she lives in Virginia with her husband and children, along with a puggle and a formerly stray cat that sneaked into the basement years ago. She enjoys biking, hiking, and all manner of activity, as long as it's balanced by chocolate and Belgian beer--or a tasty combination thereof. She love For many years, Anne sharpened her writing skills on screenplays that often became contest finalists. Today, she lives in Virginia with her husband and children, along with a puggle and a formerly stray cat that sneaked into the basement years ago. She enjoys biking, hiking, and all manner of activity, as long as it's balanced by chocolate and Belgian beer--or a tasty combination thereof. She loves to hear from readers, so please connect with her on her Facebook Fan Page (Books by Anne McAneny) or on Twitter (@AnneMcAneny).